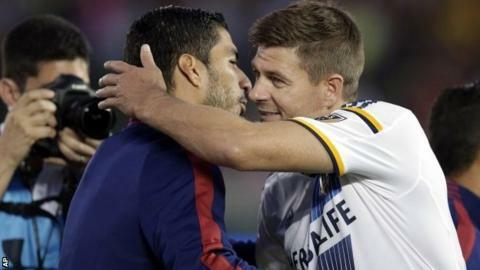 Steven Gerrard should remain in the United States if he wants to "broaden" his coaching skills, says LA Galaxy manager Bruce Arena. The ex-Liverpool captain has spoken of his desire to return to Anfield as manager, but still has more than a year to run on his contract in the MLS. "The best coaching environment in the world is the USA," said Arena. The Galaxy coach reckons the variety of top-flight professional leagues in the US can help Gerrard develop as a coach. Watch the full interview on Football Focus, Saturday 26 September, 12:10 BST on BBC One and the BBC Sport website. American football, baseball, basketball and ice hockey all have established leagues. "Stepping away from the Premier League, and away from football for 24 hours a day, will broaden his skills," added the 64-year-old. "We have top-flight professional leagues in a variety of sports and on a daily basis it's interesting to watch how teams and coaches respond to the different pressures on them on a daily basis." Gerrard, 35, has already decided who he would like as his Liverpool assistant should he ever get the job - saying in his new book that he would appoint former team-mates Jamie Carragher and Xabi Alonso. However, for now, his focus is on winning trophies on the pitch - and Arena says his new signing has made a big impact Stateside. "Gerrard is very special, the impressions he has made on people are remarkable," Arena, who managed the USA between 1998 and 2006, told BBC Sport. "That doesn't always happen but Stevie has embraced everything here at LA Galaxy - he's spoken to the fans, academy players and even those in the front office. He's bought into everything. "He's enjoyed being able to spend time with his family in public. People here are used to seeing people who have accomplished a lot so he gets away with not being noticed. "I hope we can fulfil all his playing ambitions and he enhances himself professionally for his post-playing career. He has many years left in football and I think he'll make many more huge contributions."